Just a week away, on September 1, 2017 another season of the Taiji Dolphin Drive Hunt & Slaughter will begin. Each year, from September until March, pods of dolphins make their way across Hatagiri Bay which is located near the town of Taiji in Wakayama Prefecture in Japan. While this is a scenic and even serene area at times, death haunts the infamous Cove which is located directly adjacent to Taiji’s Whale Museum. Every year during the annual government sanctioned dolphin & whale hunt, thousands of dolphins are brutally and inhumanely slaughtered. 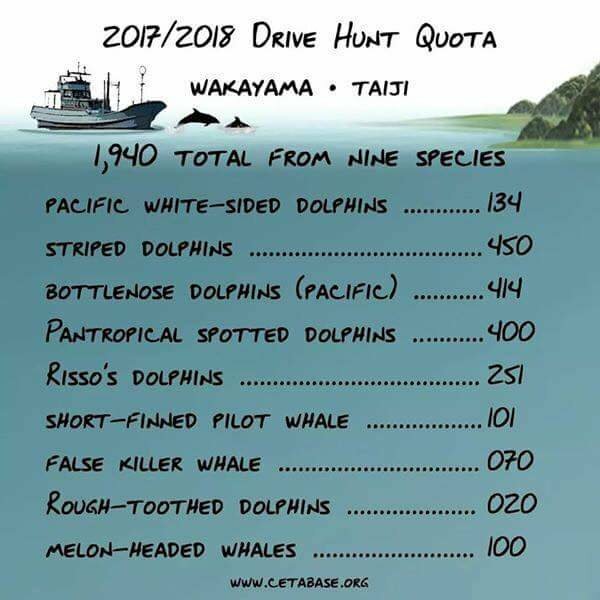 Below is the 2017/2018 Drive Hunt Quote – Taiji Fisherman’s Union is allowed to take 1,940 dolphins from nine different species over the course of six months. Over the coming weeks Voice for the Blue will do a #TaijiTuesday blog post and introduce you the nine species of Taiji Drive Hunt Quote. Not all dolphins driven into the cove are slaughtered. 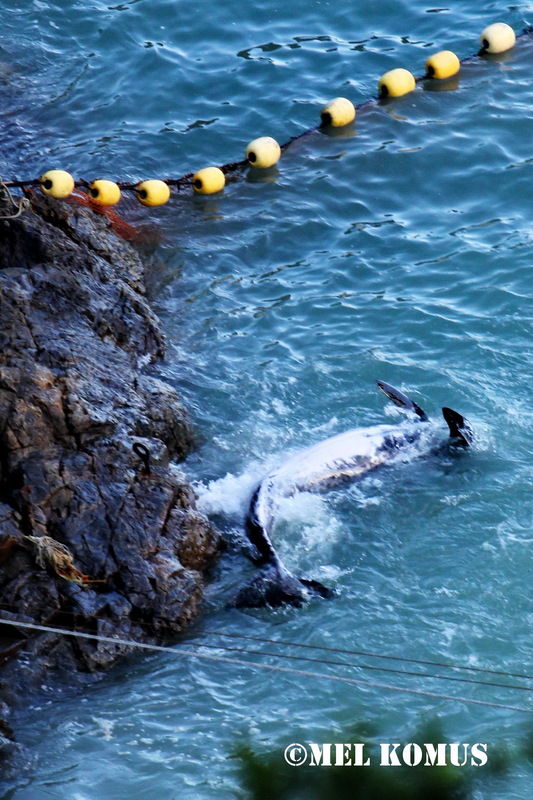 Taiji is known as “ground zero” for international trade in live dolphins. There is big money in the captive dolphin entertainment industry and there is a direct link between the captive dolphin entertainment industry and the bloody waters of the infamous Cove in Taiji. It is the dolphin entertainment industry that fuels the drive hunt and the killing of dolphins for meat unfortunately follows in its wake. 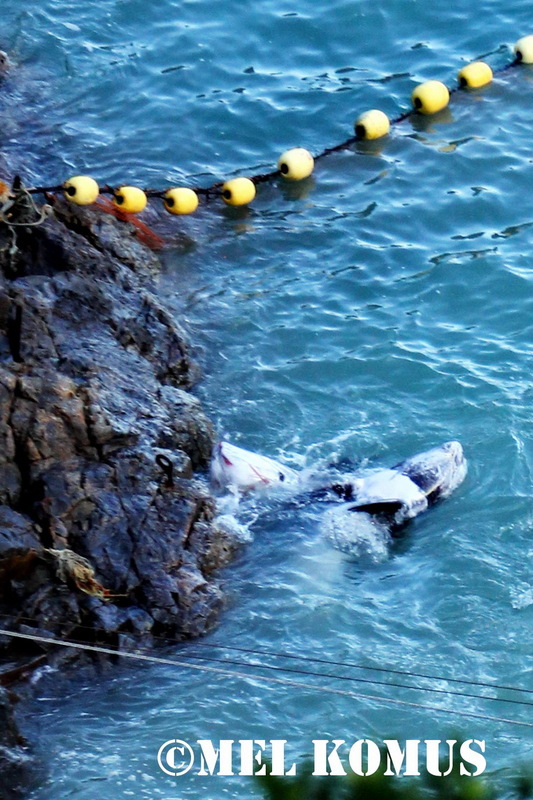 While in Taiji in December 2013, I witnessed numerous slaughters of Risso’s Dolphins, a slaughter of Striped Dolphins, one slaughter/live capture of Bottlenose Dolphins, and one live capture of Pacific White-Sided Dolphins. While each slaughter was different to experience they were in a sense all the same: The sound of dolphin taking its last breath, the sound of the Taiji killers yelling, the sound of a dolphin thrashing furiously in an attempt to escape death, then the eerie silence that tells you the slaughter is done and yet another pod of dolphins has lost its life at the hand of the Taiji fisherman. 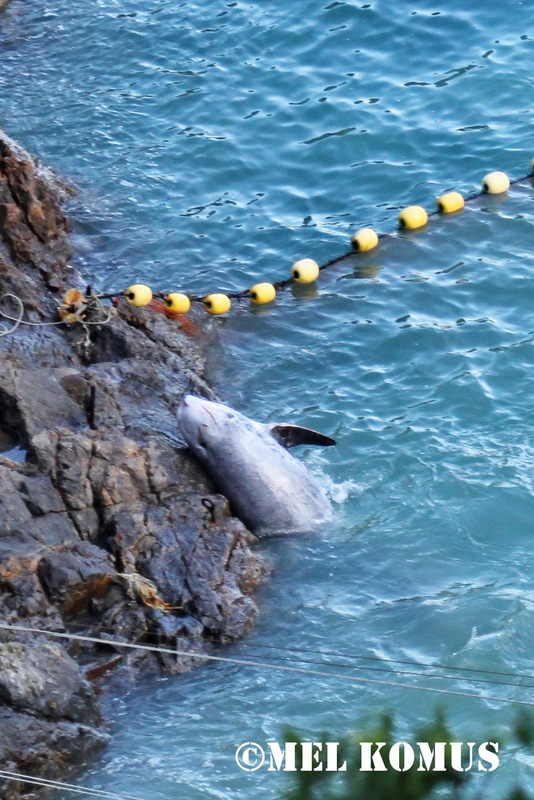 The sounds of slaughter are something that remain with you long after you left Taiji. Unfortunately many of us who stood witness to and documented the drive hunt and slaughter on the ground in Taiji are unable to return. Many activists have been held for questioning in immigration, then denied entry to Japan and deported back to our home countries. Japan has recently decided that simply witnessing and documenting the slaughter of dolphins is now a crime and classified as terrorism. Being on the ground in Taiji was one of the hardest, but by far one of my proudest moments. I may not be able to return to Taiji but I will ensure that I educate as many as people as possible on the Drive Hunt & Slaughter, the direct relationship it has to the dolphin entertainment industry and why people should not participate in swim with dolphin programs or attend marine parks, such as Sea World & Marinleand Canada. 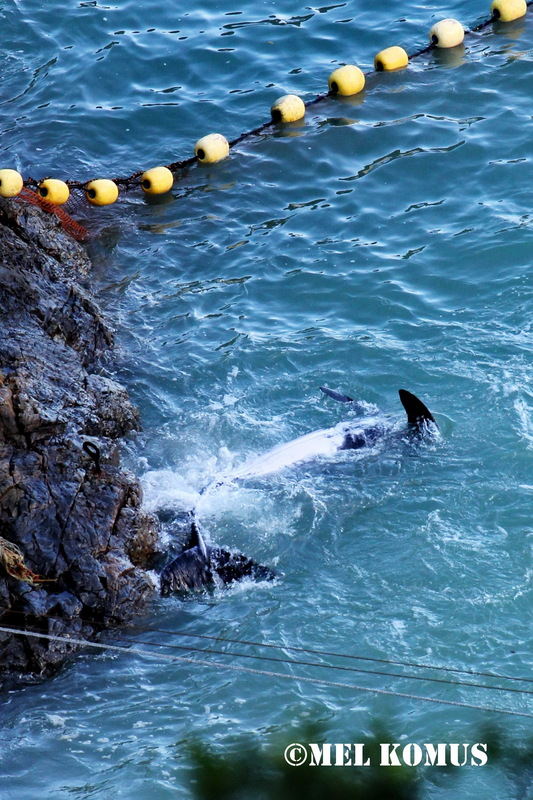 It is a daunting task at times to witness and photograph the daily atrocities in Taiji. I’ve had many people comment on twitter or Facebook and ask how do Cove Guardians do this? Well first of all, when you make the decision to go to Taiji you are well aware of what you will be witnessing each day. There is really nothing you can do to prepare yourself for this either. For me, the only thing that helped was looking through the lens of my camera and trying to take as many photos as possible … as I’ve said before the camera really is a Cove Guardians only weapon. Of course being surrounded by fellow Cove Guardians, who share your passion and daily experiences, is comforting. 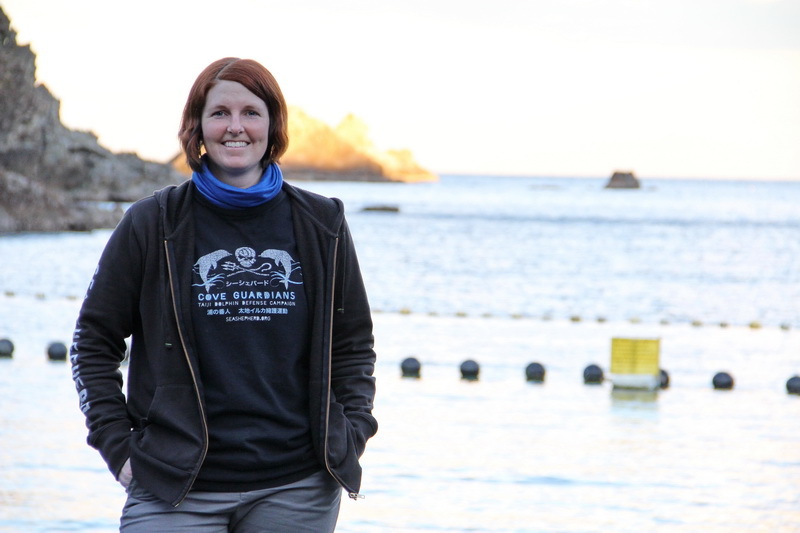 We all travel to Taiji for the same reason: to be a voice for the dolphins. 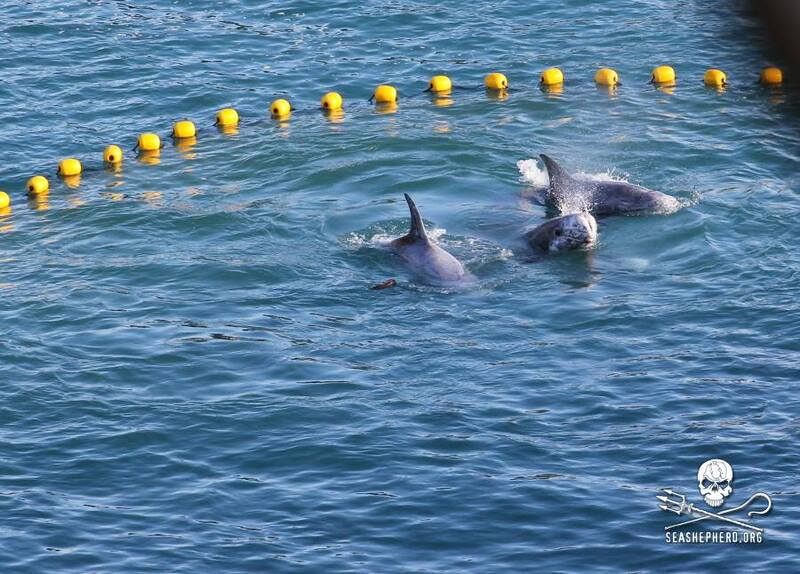 Doing this requires us to witness the tormenting, manhandling, and inhumane treatment of dolphins on a daily basis. December 20, 2013 – this will be one slaughter and one moment I will surely never forgot. Every day in Taiji is different and every slaughter is different, and each day you experience a roller coaster of emotions. The images from this day seem to be with me at all times and replay almost every night in mind. 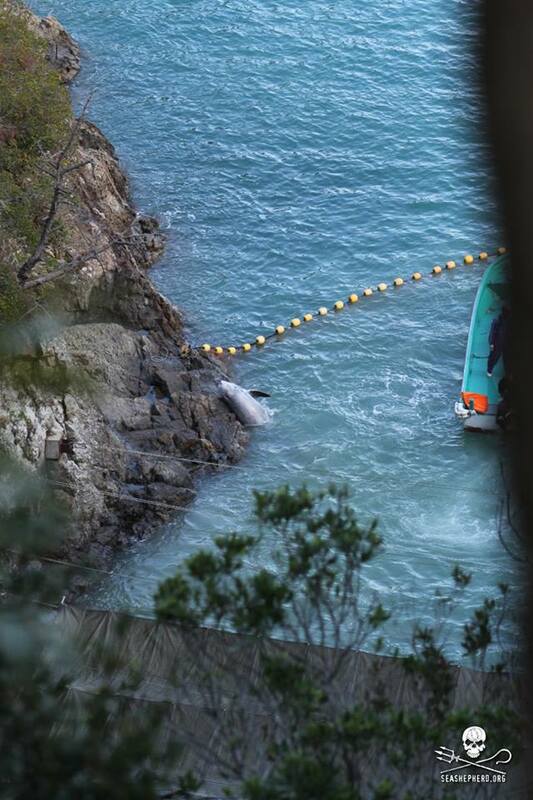 This day it was a pod of 10 Risso dolphins that were driven into the cove and the killing boats seemed to waste no time as they drove this pod for over an hour into the cove, where they would spend their last moments together. Risso dolphins are typically known to be very docile. 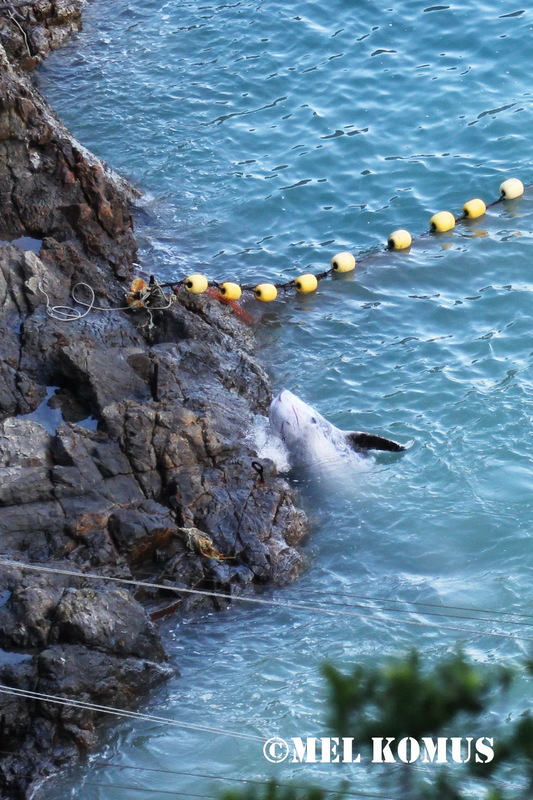 However, this pod of dolphins displayed their awareness of the impending slaughter and in fear they began to throw themselves onto the rocky walls of the cove as they were netted off. I remember standing above the Cove watching these Risso dolphins spend their last moments together before the slaughter began. I was following a few dolphins through my lens and snapping many photos. Within moments, I saw this Risso throw himself onto the rocks. My immediate reaction honestly was: I gasped and wanted to shout out a few profanities at the killers below, but I was standing right next to the livestream and managed to think before speaking. Then the tears came and my initial reaction was that I wanted to step back and compose myself, but in an instant like this your adrenaline takes over. I knew I was there for one reason: get the best shots possible of what was happening. So in a split second while crying and barely being able to see clearly through my camera, I took as many possible photos as I could. I remember standing there, beside my fellow Cove Guardian, Hunter, my gasp had got his attention and his quick thinking allowed this to be caught on the livestream as well, but he also leaned over and asked if I was alright, I just waved him off, struggled to say yeah and kept shooting. Hunter commented later that day saying ” You were on a mission and like a machine, all I could hear was the snap, snap, snap of your camera.” In that moment I was very thankful for one thing … the high speed continuous shooting mode on my camera. And Hunter was right, I was on a mission, to expose the brutality of the slaughter and be able to have the photos to display the awareness dolphins have of the situation they are in. This dolphin clearly knew he was in danger, was frightened and thought the only possible way out was to throw himself on the rocky wall of the cove. Below are a few more photos in the sequence I shot them of this particular event in the Cove that day. Even though this happened a month ago, I remember it as if it was yesterday. 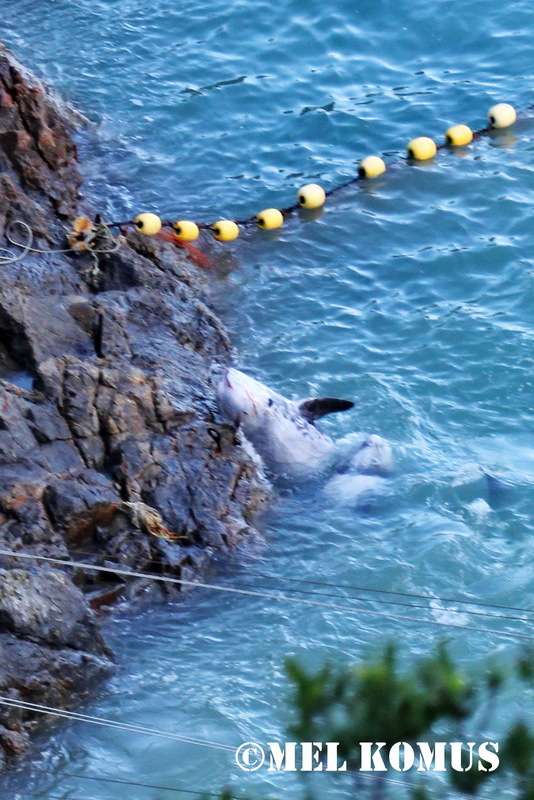 The photos speak for themselves, and as I saw this dolphin throw itself onto to rocks, it tore my heart and soul apart in just a few moments. In the end I was able to walk away from this experience, however this Risso and the rest of the pod lost their lives in the bloody confines of the infamous cove and eventually wound up lifeless on the butcher house floor. I leave you with one final phrase “Luctor et Emergo” translated as, “Struggle and Emerge.” This is the school motto of Athol Murray College of Notre Dame, where I had the privilege to attend high school. Notre Dame is an integral part of the person I have become today and these word are with me all the time and most certainly helped me to struggle and emerge from my time in Taiji, as an even stronger voice for the dolphins.